of the New Orleans lakeshore. Okwa-ta, which means 'Wide Water,' is the name the Choctaws used for the lake. Avenue), and the New Basin Canal with its accompanying shell road (replaced by Pontchartrain Expressway). Beginning about 1871 and fully developed by 1880 the man-made land of West End near the entrance to the Basin, with its park and pathways, bandstand, pavillions and various fun-making features, rivaled the similar recreations of Spanish Fort at the mouth of Bayou St. John. Lakeshore (1951), Lake Terrace (1953), Lake Oaks (1964), plus New Orleans Airport (1929-34) and the University of New Orleans campus. 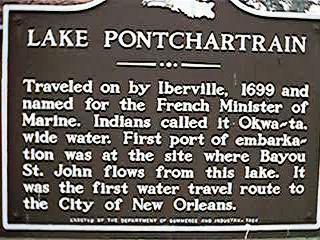 Bienville founded the City of New Orleans at present site because of easy access to the Mississippi River through Lake Pontchartrain and Bayou St. John. The city was 'owned' by France. Shortly afterward, enslaved Africans arrive, adding to the mix of cultures in the Lake Pontchartrian Basin. After a short revolution, in 1763, the Spanish government took control of the New Orleans area. At Bayou St. John and Lake Pontchartrain, the Spanish erected a fort (San Juan del Bayou)to protect the city from invasion via the lake. 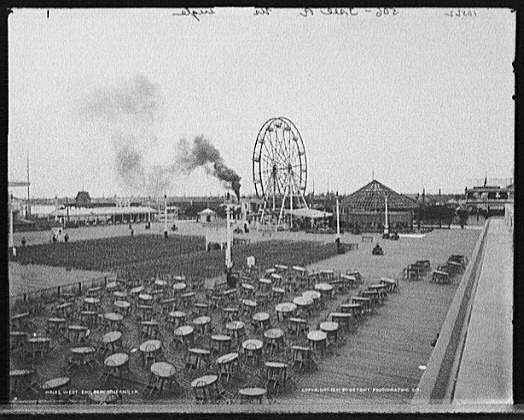 Much later it became a thriving amusement and resort area. For a complete history click the link below. People from other parts of the world began to arrive and settle in the Lake Pontchartrain Basin. All groups contributed to the culture. For example, the 'shotgun' house design which originated in Africa, was imported from the West Indies. Gumbo and other dishes were developed as a result of a mixing of cultural cuisine. The word 'gumbo' is derived from an African word for 'okra,' a staple ingredient of gumbo. Fil? (sassafras leaves) came from Native Americans who added this herb to thicken their dishes, and the 'roux' was contributed by the French. The wealthy spend their leisure time on the lake shore at several exclusive resorts, eating at the famous restaurants, gambling and enjoying the lake breezes. The first resort to open is at Spanish Fort at the mouth of Bayou St. John. Several important ports flourish on Lake Pontchartrain's shores. Sailboats carry cargo and people between the Gulf of Mexico and the Lake Pontchartrain Basin ports. Commerce grows on the south and north shores of Lake Pontchartrain. Exported products include: lumber, charcoal, bricks, shells, cotton, and oysters. Imported products include: raw materials and food unavailable locally. 1815:Travel by steamboat begins in the Lake Pontchartrain Basin, replacing many of the sailboats. 1831: The Pontchartrain Railroad connecting the city of New Orleans with the lakeshore is completed. Because of the railroad, a large resort area develops on the lakeshore at Milneburg. This resort boasts the beautiful Washington Hotel, a park, and a bath building. The Washington Hotel becomes a popular stopping point for travelers while the well-to-do of New Orleans spend pleasant weekends there. 1831-1838: The New Basin Canal is built using Irish immigrant labor, claiming the lives of many men who work on its construction. The canal serves as a transport route between downtown New Orleans and Lake Pontchartrain. Pleasure seekers take a mule-drawn barge, complete with musical entertainment, along the New Basin Canal to the resort at New Lake End (now known as West End). Now it is not only the wealthy who get to enjoy the lakeshore resorts. Families spend their holidays by taking 'Smoky Mary,' the train to Milneberg where they fish and swim. They can also rent small lakeshore camps for the weekend. During the Civil War New Orleans is occupied by Union troops. Beginning around 1850, after many years of steamboat travel in the Lake Pontchartrain Basin, railroads are built. Many people now find it quicker and cheaper to travel by train. Several towns, including Slidell are built on the new railroads. 1849: the Southern Yacht Club opens at West End. Immigrants from Ireland, Italy, Germany, and other European countries added to the cultural melting pot which makes New Orleans so unique. Buddy Bolden, considered the 'father of jazz,' was born in New Orleans in 1877 and died in 1931. The peak of his career was from 1890 to 1920. He played music at Milneburg and other lakeshore resorts. Louis Armstrong, who popularized jazz on an international level, was born in New Orleans in 1900 and died in 1971. He began his career around 1915 as a teenager. 'West End Blues' was one of Armstrong's songs which featured the local scene. 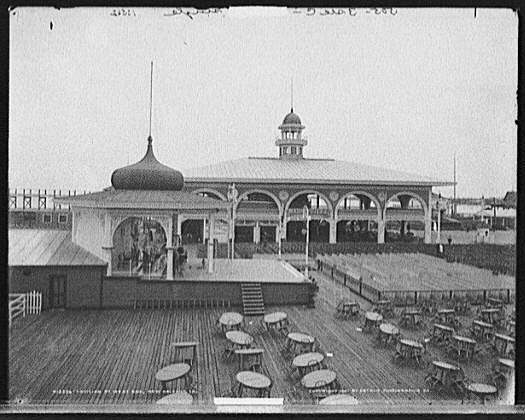 1928: Pontchartrain Beach amusement park opens where Lake Vista is today. It later moves to Milneburg, at Elysian Fields Avenue. 1924: The Inner Harbor Navigation Canal, or the Industrial Canal is opened, linking the Mississippi River with the lake, aiding shipping commerce. 1939: Pontchartrain Beach is moved to Milneburg. This photo shows the Zephyr under construction. 'The Beach' closed in 1983 and is now the location of the UNO Technology Park. 1931: The Corps of Engineers builds the Bonnet Carre Spillway, a safety valve which can be opened when the Mississippi River floods, protecting New Orleans from high water. The water can be diverted from the river to Lake Pontchartrain. It is opened for the first time in 1937. Oil and gas exploration first takes place in the Lake. Due to environmental problems related to this industry, such as wetland loss from canal dredging, and pollution from oil spills, since 1992 there are no new oil and gas drilling leases allowed in Lake Pontchartrain. 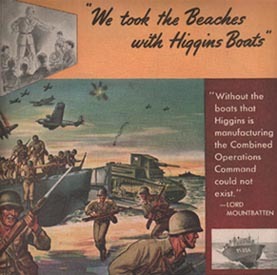 During the Second World War the land near Lake Pontchartrain, where the University of New Orleans stands today, was used by Higgins Boats to build wartime vessels. Lincoln Beach Amusement Park was opened in 1956 and was a popular attraction for African Americans in New Orleans. It closed in 1964. On the stage at Lincoln Beach many extraordinary musicians performed, including Fats Domino, Sam Cooke, and Little Richard. 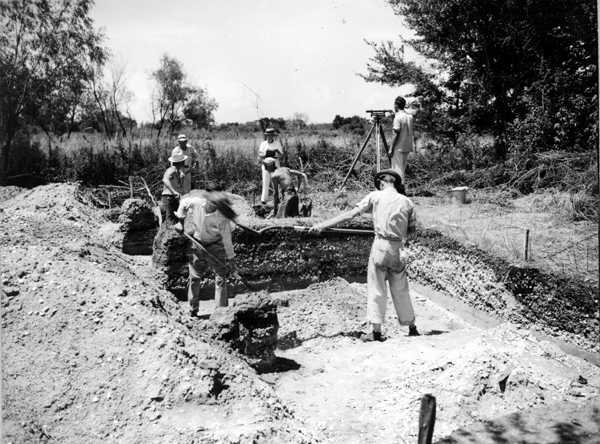 Early 1950's: The hurricane protection levees are built along the southshore of Lake Pontchartrain, protecting the whole of metropolitan Orleans and Jefferson parishes from lake storm surges. 1956: The Lake Pontchartrain Causeway is completed. 1963: The Mississippi River Gulf Outlet (MRGO) is opened to provide a short cut for shipping from the Gulf of Mexico to New Orleans. It allows saltwater from the gulf to enter the St. Bernard marshes and Lake Pontchartrain, causing the loss of freshwater marshes and the conversion to water of much of the St. Bernard wetlands. 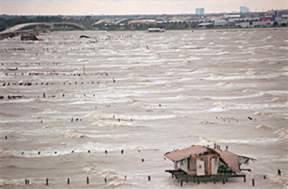 1965: Hurricane Betsy hits the Lake Pontchartrain Basin, causing flooding and other destruction in New Orleans and St. Bernard Parishes. A large number on Hispanic people made New Orlean their home during the 60's--again enriching and adding to the local culture. 1972: Pontchartrain Beach swimming area closes due to unacceptable levels of pollution which threaten the health of bathers. 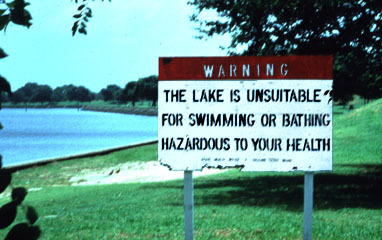 1979: 'No swimming' advisories are posted along the lake's southshore in Orleans and Jefferson Parishes. 1983: Pontchartrain Beach Amusement Park closes. Today some remnants of the famous Zephyr ride and other memorabilia are on display outside City Hall on Williams Boulevard in Kenner. 1990: Shell Dredging is halted in Lake Pontchartrain. The dredging, which had been ongoing for over 60 years, wreaked havoc on the Lake's ecosystem. Much information found on this page is from the Save Our Lake website. Please click here to visit their site. Hurricane Georges wipes out all but five Hayne Boulevard camps. 2005: During the aftermath of Hurricane Katrina, breaks in canal walls allowed wind driven Gulf of Mexico waters into the lake to devastate the greater New Orleans area. All but one camp along the New Orleans lakeshore was destroyed. The New Canal (West End) Light(house) was toppled. Yacht harbors and boat slips were badly damaged. The Southern Yacht club burned.